Version 3.1.0.0: This highly configurable Heidenhain device driver for CNCnetPDM enables you to acquire and output machine-, process- and quality data from machines with Heidenhain TNC 426, 430, 320, 620, 640 and iTNC 530 controllers, see adapted controllers. It also allows you to control your devices by its ability to set or change PLC data values and machine parameters. You can dynamically define your own set of items (up to 35) that can be enabled and disabled on a per machine basis by an INI file that is automatically created with reasonable default values for each machine configured. This INI file also allows you to define your own names for every tag. Make sure that you have an Ethernet network connection between your PC and the machine and get data, use our exe utility to do so. Please also add an exception for TCP port 19000 to your Firewall. Download the Heidenhain driver, extract all content of heidenhain_dll.zip into the folder where you have CNCnetPDM installed. 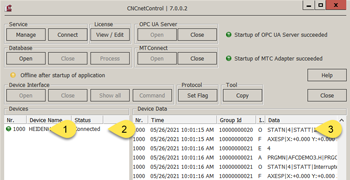 Edit CNCnetPDM.ini and add a new device as described in the quick start guide point 7. If you already have an entry in section [RS232] for a machine with a Heidenhain controller you can simply copy and paste this line and change its content. Right to the DNS Hostname of your machine (here AXA1012) enter a unique sequential number (here 1) between 1 and 58 for every Heidenhain controller connected to CNCnetPDM. CNCnetPDM automatically copies the original heidenhain.dll and appends the machine number as configured in the INI file, e.g. heidenhain_1001.dll for machine 1001. In addition an INI file with the same name is automatically created by the device driver, e.g. heidenhain_1001.ini for your first machine. Section [GENERAL] contains information about global parameters used by the driver on startup, please only change the value from iTNC530 = 0 to 1 if you’re using an iTNC530 or TNC320, TNC620 or TNC640 controller! Commands defines the number of commands you’d like to execute, maximum value = 35. Entry ‘Legacy PLC’ allows you to convert PLC byte, word or dword output from older controllers like TNC426 or TNC430 to a proper format. Please set Legacy PLC = 1 in case the output differs from the values you see at the controller. Section [MARKERS] contains addresses of PLC markers that are automatically used to identify the operation mode and program status of your machine if the controller does not support high-level commands to acquire this information. Typically used with older TNC426 and 430 controllers. Items you query are organized in numeric sections e.g. . Every section contains entries where you can define names and parameters for a specific item. If you set this to 0 the command is not executed to read data from the device. Commands for writing data must not be set to 1! Command to be executed e.g. cnc_oeestatus for the command group that contains running status. To change a command select an available command group, copy it and paste it into the INI file. For some commands input parameters can be used to set an input parameter (PLC), control output formatting e.g. program name with or without path or a divisor for an output value, see the command description. Some command groups have sub-commands that enable you to define a specific item to be output by the driver e.g. statenumber from cnc_oeestate outputs the device state. Below you can find commands and output items that can be used with this driver. Important note: Almost all of the items with note ‘iTNC530 only’ are also supported by newer controllers like TNC 320, 620 and 640. For TNC 426 and 430 most items can be acquired by using plcmarker, plcbyte, plcword or plcdword commands. Please contact us for detailed instructions. ‘Input parameter 1’ = PLC address. Command for writing PLC byte values, PLC address and value from your application. Command for writing PLC word values, PLC address and value from your application. PLC address has to be divisible by 2! Command for writing PLC dword values, PLC address and value from your application. PLC address has to be divisible by 4! To quickly test and build a working INI file for your controller you can use our tool devicedrivertester. If used with this driver the program creates INI file heidenhain.ini. To use this file for a machine defined in CNCnetPDM.ini you can simply append an underscore and the machine number e.g. heidenhain_1001.ini for device number 1001. After clicking on button [Cmd], an additional dialog opens. The first item in input is the PLC address or machine parameter followed by the desired value and a flag. Flag only has an effect on machine parameters. Possible values: 0 = persistent, 1 = temporary, 2 = persistent on reset. The device driver writes a log file entry for any communication issue to the log file of the device. The file can be found in subdirectory \log of your CNCnetPDM program folder. The file format for the log file is log_ + device number + _ + date.txt. Please check this file first if you observe an issue. Deactivate commands with issues by setting them to ‘Active = 0’. If the machine shows a red icon, state disconnected and you get just output E = 0 the machine is not reachable at all. This has nothing to do with the device driver, it’s a network issue, DNS Hostname or IP Address is wrong. If the machine shows a green icon, state connected but you just get output E = 1 the machine is reachable but the controller does not respond to commands, check your controller setup and the parameters used in CNCnetPDM.ini (esp. port number).Please use the tool HeidenhainData to check if the machine replies to commands. Delete all heidenhain_NNNN.dll (NNNN = machine number) files. If you already have created adapted INI files for specific devices do NOT delete the heidenhain_NNNN.ini files.